Friday, 12 October was a good day for over 50 happy infants and the Principal of Rose Hill Infants School in St Patrick’s. 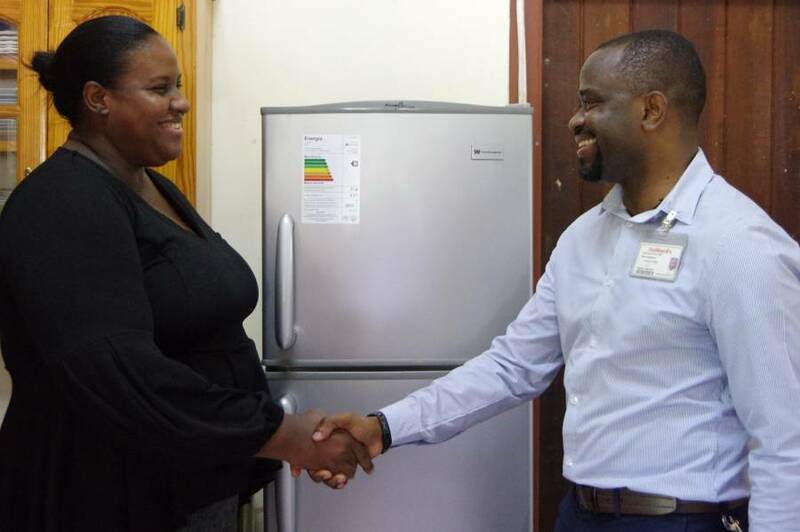 The school, which has served the community for over 50 years, received the much-needed gift of a brand new refrigerator to look after the lunch and break time needs of the little ones. Mrs Mark, the school’s principal, communicated their urgent need to Jonas Browne & Hubbard (G’da) Ltd. and was thrilled at their extremely prompt response. She stated “the school looks after the break time and lunchtime needs of approximately 50 children, so having a refrigerator in good working condition is imperative. This gift is so timely for us and will go a long way towards taking care of the important nutritional needs of the children. All of us and the children wish to offer Hubbard’s our heartfelt thanks,” she concluded. Phillip also noted that the white Westinghouse fridge given to the school is an energy efficient model, keeping both the school’s electricity bills and carbon footprint as low as possible, an important factor for consideration with respect to the future of our nation’s children and the planet.